Earlier estimates of the chlorine emission from volcanoes, based upon evaluations of the pre-eruption magmatic chlorine content, are too low for some explosive volcanoes by a factor of 20 to 40 or more. 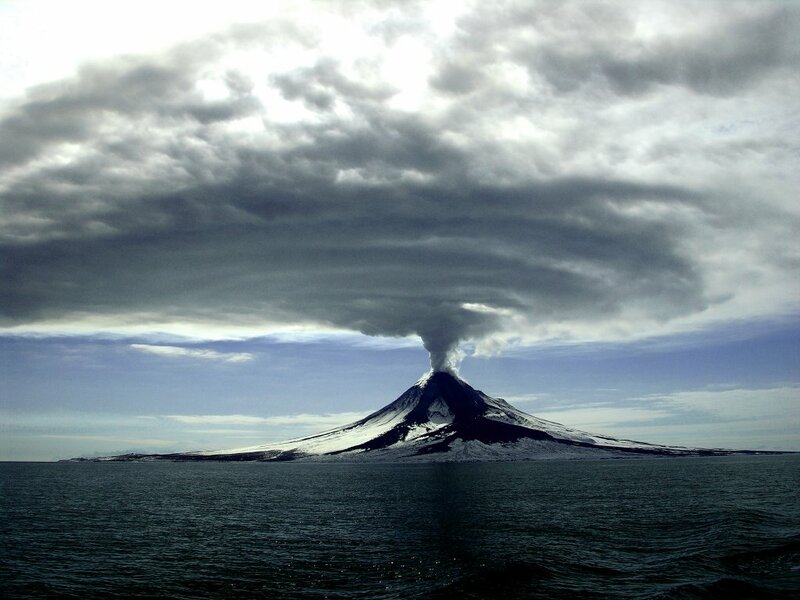 Degassing of ash erupted during 1976 by Augustine Volcano in Alaska released 525 x 106 kg of chlorine (±40%), of which 82 x 106 to 175 x 106 kg may have been ejected into the stratosphere as hydrogen chloride [HCl]. This stratospheric contribution is equivalent to 17 to 36% of the 1975 world industrial production of chlorine in fluorocarbons. [The] eruption of the Bishop Tuff from Long Valley Caldera, California, 700,000 years ago generated 100 km3 of air-fall ash(19). If the magma degassed 0.25% chlorine (equivalent to Augustine Volcano), this eruption may have injected 289 x 109 kg of HCl into the stratosphere, equivalent to about 570 times the 1975 world industrial production of chlorine in fluorocarbons. For context, a big issue at the time was to characterise the budget for chlorine in the stratosphere, given it’s importance in ozone depletion. While there is quite a lot of HCl emitted by volcanoes, that form of chlorine is soluble, and is swiftly rained out, unlike the much less reactive human-made chlorofluorocarbons (CFCs) which can stay in the atmosphere from many decades. Multiple studies subsequent to the Johnston paper confirmed that the volcanic contribution to stratospheric chlorine is actually very small, but this paper was a genuine attempt to constrain this term. To summarise, there are two cases mentioned, Augustine (in Alaska, 1976) and the Long Valley Caldera (California, 700,000 yrs ago), with estimated multiples of 0.17-0.36 and 570 of HCl injection into the stratosphere compared to the annual industrial source of Cl in CFCs. [Note – if anyone has an earlier usage, please let me know]. An important volcanic event in 1980 was of course the huge eruption of Mount St Helens in May of that year. Tragically, the author of the Science paper, David Johnston, an up-and-coming USGS volcanologist, was himself killed in the blast a couple of months before his paper appeared. Later that year, in October, President Reagan commented on the eruption, suggesting that “one little mountain out there [Mt. St. Helens], in these last several months, has probably released more sulfur dioxide into the atmosphere than has been released in the last ten years of automobile driving or things of that kind.” However, while the volcano emitted roughly 2×106 metric tons SO2, annual emissions from cars were 30 x 106 tons (out of a total human emission of ~131×106 tons). Reagan was out by a factor of 150. This was just the beginning of the mangling. More relevant for the growth of the volcano gambit, these results got more and more warped in subsequent retellings. For instance, in 1990, Dixy Lee Ray, the ex-marine biologist and former (Democratic) governor of Washington, wrote in her book: “The eruption of Mt. St. Augustine in 1976 injected 289 billion kilograms of hydrochloric acid directly into the stratosphere. That amount is 570 times the total world production of chlorine and fluorocarbon compounds in the year 1975…. So much is known.” She mixed up the huge eruption 700,000 years ago, with a much smaller one in 1976, but it would get worse. The Johnston paper also became a staple of the folks engaged in rearguard defenses against the 1989 Montreal Protocol, in particular, the Maduro and Schauerhammer book “Holes in the Ozone Scare” quotes the paper accurately, but ignores subsequent work ruling out the HCl source for stratospheric chlorine. This was well discussed by Sherwood Rowland in a 1993 Science commentary which aptly enough was focused on the need for better scientific communication with the public. In June 1991, Mt. Pinatubo in the Philippines erupted, and unsurprisingly became the volcano of choice for the contrarians. Rush Limbaugh discussed this at various points in 1992 and in his 1993 book. On Nightline he stated: “it is man-made products which are causing the ozone depletion, yet Mount Pinatubo has put 570 times the amount of chlorine into the atmosphere in one eruption than all of man-made chlorofluorocarbons in one year”. (Note the further confusion attributing the eruption 700,000 yrs to the one that just happened). In his book “The Way Things Ought To Be” (1993) Limbaugh stretched the facts still further: “Mount Pinatubo in the Philippines spewed forth more than a thousand times the amount of ozone-depleting chemical in one eruption than all the fluorocarbons manufactured by wicked, diabolical, and insensitive corporations in history.” He claims he got this information from Dixy Lee Ray’s book, “the most footnoted, documented book I have ever read.” Which, as noted above was already garbled. (More discussion on Limbaugh’s errors here and here). A year later (2007), Martin Durkin in his execrable documentary claimed that “One volcanic eruption for example, puts more pollution into the atmosphere than ten years worth of human activity.” This, despite being totally unspecific (which pollutant does he think he is referring to? ), is of course wrong in any case. Perhaps he was channeling Reagan? 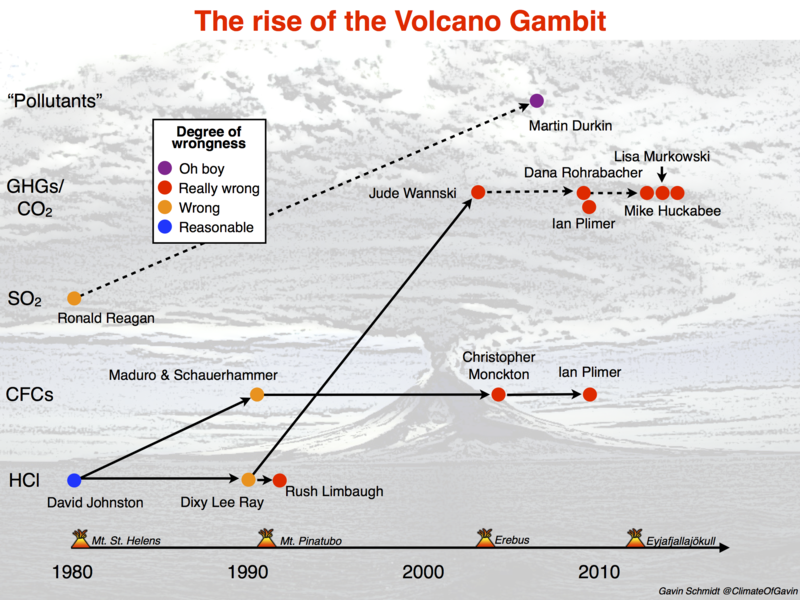 As in 1992, a new eruption gave rise to a new eruption of the gambit. In 2009, the “Stop Global Cooling” crowd stated: “Sure, volcanoes like the one spouting off in Alaska right now spew much more CO2 than humans could ever think of”. Similarly, Congressman Dana Rohrabacher in March of that year added: “Can one huge volcano spew more CO2 into the atmosphere than all the people? Yes”. Ummm… no. And yet it goes on. Ian Plimer in another contrarian tome included some even more made up facts: “massive volcanic eruptions (e.g. Pinatubo) emit the equivalent of a years’ human CO2 emissions in a few days” (p472) and “Volcanoes produce more CO2 then the world’s cars and industries combined” (p413). On p217 he claims that while “Mt. Pinatubo . . . released 20 millions tonnes of sulphur dioxide” it also released “very large quantities of chlorofluorocarbons”, citing Brasseur and Granier (1992) who don’t say there were any CFCs in the eruption, and even on chlorine, actually say the opposite: “after the eruption of Mount Pinatubo, the input of chlorine to the stratosphere was probably small”. In 2013, it was the turn of Eyjafjallajökull in Iceland to steal the limelight. Ex-Gov. Mike Huckabee said: “The volcano that erupted over in Northern Europe actually poured more CO2 into the air in that single act of nature than all of humans have in something like the past 100 years.“. Senator Lisa Murkowski in 2014 similarly mentioned a volcano she “had heard about” in Iceland. “The emissions that are being put in the air by that volcano are a thousand years’ worth of emissions that would come from all of the vehicles, all of the manufacturing in Europe,” she said. Huckabee was using the same point as recently as July 2015: “a volcano, in one blast, will contribute more [CO2] than 100 years of human activity“. A century or a millennium – who’s counting? Again this is all patent nonsense – the amount of CO2 emitted by Eyjafjallajökull was in fact more than 20 times smaller than just European aviation emissions per day – and the claim was rightly debunked by FactCheck.org, Slate, and HuffPo at the time. To summarise, a speculative paper (that was later contradicted) about HCl emitted in a volcano 700,000 years ago is the progenitor of statements related to SO2, CO2, greenhouse gases or just “pollutants” in general, and has been associated with Mt. Augustine, Mt. St. Helens, Mt. Pinatubo, Erebus and Eyjafjallajökull, with comparisons to all industrial emissions in a year, 100 years, or since the industrial revolution, all cars in a decade, or indeed a thousand years. The volcano gambit is the universal comparison, untethered to any actual facts, and look for it to resurface again the next time a big volcano hits the news.